Jean Patou 1000, is a beautiful fragrance. Very sophisticated. 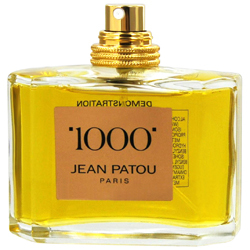 Jean patou "1000", is so seductive, and sensual! It has been one of my ALL time favorites for years!! I have worn it, & men & women ask me what I'm wearing! It's divine, trust me on this, it's wonderful! I been wearing 1000 for years. I Love it,Love it. I REFUSE TO WEAR ANY THING ELSE.